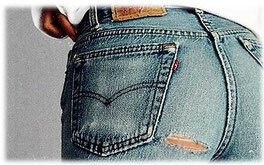 As we all know, finding a new pair of perfect fitted jeans/pants can be annoying and often unsuccessful. Who hasn't returned home empty-handed from a shopping trip because you didn't find a single pair of fitting jeans/ pants? But hold on ... help is on the way. After reading this post, you will never feel frustrated again because the pants you trying on can't be zipped or got stuck half-way on your thigh. On top of that, you don't even have to use a dressing room. Here's what you have to do: take the pants of your choice, zip them, then fold the waistband around your neck and if the ends of the waistband meet in the front, the pants fit you. Tipp: For a loose fit, the ends of the waistband must overlap. For a skinny fit, the slight touch of the ends is enough. Believe me, this works. I have related on this trick over and over again. To make sure I am not fooling you, take a pair out of your closet and go for it. Habe so meine Jeansgröße ausgesucht und die Hose passt perfekt.